After working with over 1,000 dealerships, the reason our clients continue to market with us each and every month is because we implement a System for Predictable Growth. There’s really two types of dealers out there…there are market driven dealers and then there are marketing driven dealers. A market driven dealer makes reactive advertising decisions and pays for image enhancing, branding, “get your name out there” billboard, radio, TV, and newspaper campaigns because they know they should be advertising. No one says you can’t grow the business with poor advertising, but a lot of the growth dealerships experience comes from well-timed weather, an improving market and economy, or a focus on sales process and training. Customers are solar powered, when the suns out they’re out. When the market is up, business is up; when it’s down, business is down. A marketing driven dealer has a pro-active, integrated, direct marketing plan designed to touch their buying base 52 to 104 times per year that is quantifiable. Barring natural disaster, a marketing driven dealer experiences predictable growth. Here’s how we put more control into our clients’ hands. 1) We Grow Your Active Customers, defined by folks who’ve spent money with your dealership in the last 12 months. We do this by reactivating lost customers (those who haven’t spent money with you in the last 12 months) and by driving new customers through the door (these are competitor’s customers and orphan owners that ride what you sell, live in your backyard but have never bought from you). If we can increase the number of customers who do business with you each year, your business will grow. 2) The second way we create a System for Predictable Growth is by increasing your Annual, Average Customer Value by increasing the frequency of visits to your dealership. Let’s face it, when your customers walk through your doors, they are kids in a candy store…they can’t help themselves but to purchase stuff. If we can simply increase the amount of times they visit your dealership each year, they will buy more parts, more accessories, more gear, they’ll service their unit more often and they’ll shorten their trade cycle. We know past customers who are loyal, like know and trust you so your closing ratios go through the roof along with your margin because they’re less likely to haggle over price. Put another way, a marketing driven dealer understands this simple formula. Annual increase in active customers + annual increase in customer value (or the same) = Annual Growth. If we can get more riders to walk through your door, more often over the next 12 months, you will grow your business in a very predictable way. Curious what your numbers are? Take your 2016 revenue and divide it by the number of customers who spent money with you to find your Average (Annual) Customer Value. If you are an integrated client of ours, call your Account Executive and they can walk you through this math. If you are Talon dealer, run a customer report, export to Excel and sort ‘Previous Years Sales’ by ‘A to Z’, highlight the column for your total revenue last year and scroll to the bottom of that column to see how many active customers you had who spent money with you last year. Or, call us at 877-242-4472 and we’ll run these numbers for you! If you’re a Lightspeed Dealer, we can integrate with your DMS and pull these numbers for you as well. As you can see, a 10% bump in both metrics for the $4 Million Store above equates to over $839,000 in growth. For the $14 Million Store, it bumps their revenue by almost $3,000,000! You might think, ‘Eric that’s too good to be true’, but it’s not. 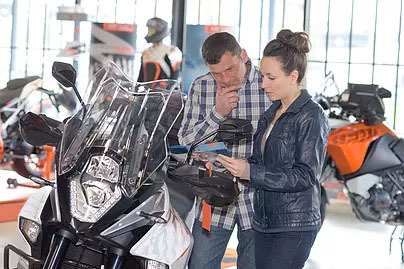 We’ve used this exact system to help grow many of our clients’ businesses like Wolverine H-D. Over the years we’ve been working with them, they’ve grown from 600 units, $11 million to over 1,200 units and $32 million. When we first started working together, they had 3,400 active customers with an average customer value of $3235. Today, they’ve grown their active customers to 9,000 and their Average Customer Value (ACV) to $3555 resulting in $21 million in growth! I know that over time with consistency, the Sharp Shooter Program can do the exact same for your dealership. The next step is to call us so we can pull your numbers and show you the opportunity that exists in your database to grow your business predictably. The average dealership has only 30% of their customer base actively spending money with them with an average customer value that can grow tremendously. We can kick off your Annual Predictable Growth System in August with a Soak Up Summer campaign, Back to School Event or Dog Days of Summer Party. There are many more options where those came from and with just five short months to go in the year, it’s more important now than ever to drive as much traffic through the doors and generate as many leads as possible this summer! For more information on how the Sharp Shooter Program can help you achieve your marketing goals in 2017, call me on my direct line 877-242-4472 ext: 112. Happy selling.